BRIDGETOWN - – Mischievous, grossly inaccurate and under-researched! 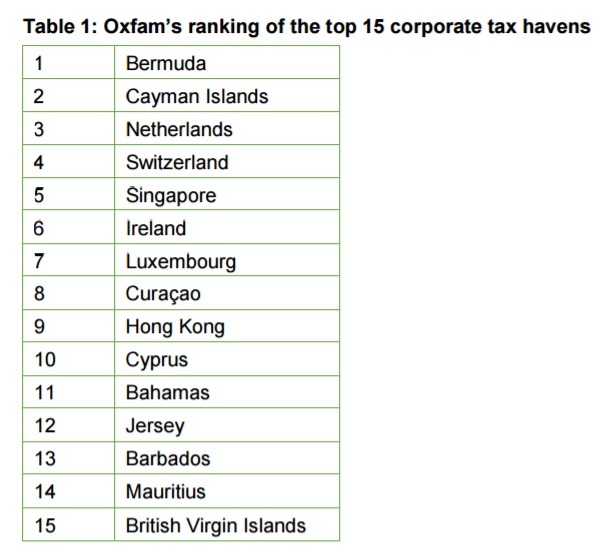 That’s how three Caribbean countries deemed among the world’s worst corporate tax havens have described a report published by international charity Oxfam, entitled ‘Tax Battles – The Dangerous Global Race to the Bottom on Corporate Tax‘. Authorities in Bermuda, listed as the worst offender, the Cayman Islands, ranked second, and Barbados, 13th, are hopping mad at the claims leveled in the 46-page report that lists 15 countries. “Corporate tax havens are propping up a dangerously unequal economic system that is leaving millions of people with few opportunities for a better life,” Oxfam tax policy advisor Esme Berkhout said in a statement. Bermuda’s Finance Minister Bob Richards rejected the findings pointing to what he called “serial errors” in the report, which found that multinational companies reported US$80 billion in profits on the island in 2012. Richards argued that the findings were based solely on volume of assets, which is not a recognized criteria of transparency and compliance, on which Bermuda measures well. “Oxfam, directly and indirectly, appears simply to have ignored Bermuda’s internationally recognized role as a centre of corporate and tax transparency and compliance, a key ally in the fight against money laundering and all criminal activities, and a committed partner in the initiatives of the OECD on tax reform under the BEPs initiative,” he said. The Bermuda Finance Minister also strongly denied claims that the island has anonymous shell corporations and that it had failed to co-operate with international processes to combat tax avoidance and transparency. In the Cayman Islands, Financial Services Minister Wayne Paxton described the report as “unhelpful at best” and accused Oxfam of exploiting misinformed public opinion as part of an agenda to influence the public policy of G20 countries. “It may be detrimental to the overall shared goal of combating criminal behaviour and addressing income inequality,” he said, stressing that the island’s inclusion in the so-called tax haven list was flawed. “I say that they are hypocrites . . . and I am prepared to dispatch the appropriate correspondence to the hierarchy of Oxfam on behalf of Barbados, condemning their utterances and warning them about the irreparable damage that their reckless comments could cost a jurisdiction like Barbados,” he told Barbados Today online newspaper. Inniss underscored that Barbados was a clean jurisdiction, saying that it had recently been endorsed by the Organization for Economic Cooperation and Development (OECD).